For something as common in many of our diets as dairy, it’s a little surprising that there are so many misconceptions about how it impacts our bodies and the environment. Read on for some of the biggest myths about dairy. 1. Dairy Makes You Gain Weight. Just like any type of food, eating dairy doesn’t automatically lead to weight gain—eating too much dairy just might, but eating too much of anything isn’t exactly wise or healthy. 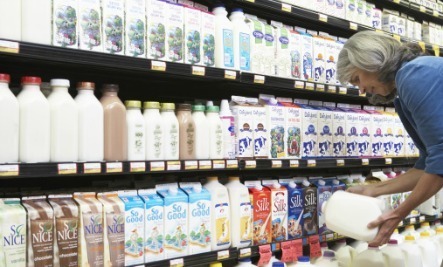 Dairy products can be part of a healthy, balanced diet, but moderation is key. Some studies actually suggest that a few small servings of dairy can lead to weight loss. 2. Lactose Intolerance Means You Have to Avoid All Dairy. Lactose intolerance is not an allergy, so you don’t have to completely restrict dairy products from your diet. Foods that are labeled lactose-free, milk and yogurt in particular, are safe for most people, and natural, aged cheeses like, swiss, cheddar and parmesan are usually fine, too. Unsure about whether or not a cheese is safe to eat? Look at how much fat is in it; the higher the fat, the less lactose it typically contains. 3. Calcium Supplements are Enough. Calcium supplements don’t entirely replace the need for natural sources of calcium in your diet—and they may provide little help for your bone health. For some people, calcium supplements can actually be harmful—studies have found a tentative link between taking supplements and higher risks of heart disease and death. The best way to get calcium is in your diet. But that doesn’t necessarily mean you need it from cow’s milk—plenty of nondairy products, leafy greens, beans and legumes in particular, are good sources of calcium. Tofu, fortified nondairy milks and orange juice, and almonds are also good sources. 4. Milk Causes Mucus Build-Up and Asthma Attacks. Will that glass of milk make your sinuses go haywire or your asthma flare up? Though it’s an all too common old wives’ tale, there’s no scientific proof to back this up. The exception? Some people with milk allergies have symptoms that are similar to asthma after consuming dairy. For the rest of us, though, it’s almost certainly just a placebo affect. 5. Humans Are Not Designed to Drink Cow’s Milk. The only food that’s solely exists for human consumption is breast milk. Cow’s milk, undoubtedly, is meant for calves to nurse on. And, it’s true: many people can’t tolerate dairy products. But that’s not true for everyone—and it doesn’t mean that no one can enjoy dairy products because cow’s milk is not specifically designed for human consumption. 6. Raw milk is better for you. In many parts of the United States, raw milk is banned for sale and/or consumption. And, it’s true—the raw stuff CAN lead to disease—several e.coli outbreaks have been linked to raw milk, and hundreds of people have been hospitalized after consuming the stuff in the past few decades. Though many raw milk fans tout the health benefits of the stuff, the science behind these studies is not all that clear, and the health benefits of pasteurization are very, very clear. 7. Organic Milk is Healthier than Regular Milk. While it’s technically true that organic milk is healthier than nonorganic milk—studies have shown that organic cow’s milk actually contains more omega-3 fatty acids, for instance—many of the nutritional advantages of organic milk are so negligible that they’re barely worth talking about. Now, of course, organic milk is better for the planet and the animals, which is enough of a reason to reach for the organic stuff. Was this article written by the milk/dairy industry? It certainly sounds like it. Thanks Katie Waldeck for a breath of fresh air. #4 relates to my Dairy Allergy onset by a methanol > formaldehyde > formic acid exposure from Pulp Mill emissions. Inhaled formaldehyde first metabolizes to Formic acid in our livers. Then to Lactic acid in all our cells. Environmental formaldehyde is in vehicle exhaust new clothing carpeting etc. Vehicle exhaust continued to be additive to my workplace exposure to the point where I had stroke like symptoms (MELAS) from having a cow dairy yogurt one evening. I had enough sense to quit all dairy products and was off my puffers within weeks and Fibromyalgia free. Elevated cellular Lactic acid will cause the muscle pain experienced by excessive physical activity. 1.5 years later my Naturopath suggested I try goat or sheep dairy products with no adverse effects. If I consume dairy by mistake as I had with a Nut based yogurt where the manufacturer used a cow dairy starter all I know is that the ambulance scraped me off the floor after passing out. My theory is the Lactic acid in cow dairy is First Cousins to our cellular Lactic acid. 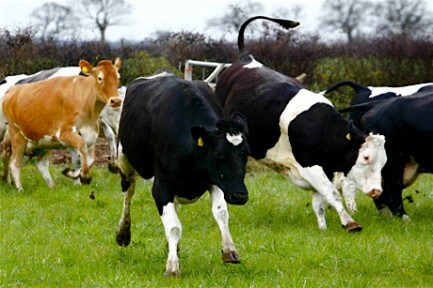 I recommend that Asthma OR Fibromyalgia sufferers do a cow dairy exorcism for 6 weeks or so and see if the need for puffers vanishes just like the Fibromyalgia that MAY grow wings and flee. Dairy: animal abuse. At least drink organic, have you seen how cows and their babies are abused for you to have a glass of milk? I was never a big milk drinker. I love cheese and ice cream. Now a days I drink nut milk or coconut milk its healthier and less after taste. Im moving toward a vegan lifestyle. Love all dairy products, they are good for the bones too.